Watch our Eagles fly! 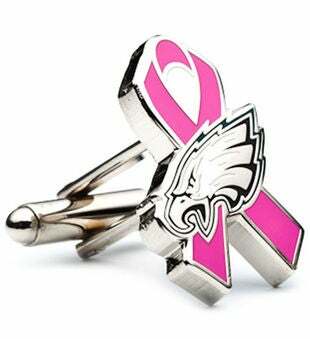 Show your support with The Philadelphia Eagles Breast Cancer Awareness Cufflinks, where 10% of proceeds are donated to breast cancer research. They are 5/8" x 5/8" in diameter, Rhodium plated base metal and enamel, and come with bullet back closures.